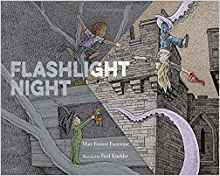 Matt Forrest Esenwine is the author of the new children's picture book Flashlight Night. His poems have been published in various magazines and collections. He lives in Warner, New Hampshire. Q: How did you come up with the idea for Flashlight Night? A: It was August 2014, and I had been down at a SCBWI meeting, an informal gathering of Boston-area children’s-lit folks, and it was a weeknight. It was an hour and a half drive for me, it was 10 or 10:30 at night, it was darkness, and all I see are the headlights. For some reason the phrase “flashlight opens up the night” came to me. I write poetry primarily. Publishing is hard to get into, children’s publishing is hard to get into, and children’s poetry is the hardest niche. I’ve always approached writing from a poetic standpoint. I banged around the phrases. By the time I got home, I had the opening in my mind of the book, and the ending of the poem, I had that nailed down. Over the course of the following week in every spare moment I worked on fleshing it out. I had a rough draft by the end of the week. It was more like a 15th draft—If I stop, I can’t go back to where I left off. I start from the beginning. I tweak, I go back—I can’t move forward until I fix it. I spent a few more weeks tweaking. I wrote it in August 2014. I send it to my editor in 2015, and by January I had a deal. Q: This is your first picture book—was the writing process any different than it had been with your previous work? A: At first I wasn’t sure what it was. I wasn’t setting out to write a picture book. My whole focus had been working on poetry. I was writing children’s poetry, not a picture book. In my mind, it was a poem, but I thought, it might be long enough to be a picture book. I made some revisions that would suit a picture book, but at heart, it is a poem. It’s a wonderful thing to read in the reviews—they refer to it as a poem. A rhyming picture book is not necessarily a poem. Very often they are two different things. Q: What do you think Fred Koehler’s illustrations add to the book? A: An increased sense of imagination. An increased love of books. An increased appreciation of poetry. I read children’s literature blogs. Teachers and librarians love the text and the language of the book, the idea that the fantasy is in light and the darkness is the reality. They’re having school programs with evening readings—reading nighttime books, flashlight excursions. I’m thinking this is great. A: That’s a whole separate interview! A second book will be out in the spring, co-authored with Deborah Bruss. We’re part of the same SCBWI critique group here in Concord, New Hampshire. She had a couple of lines and didn’t know what to do with them. This was back in 2011 or 2012. I have six or seven picture book manuscripts, three poetry collections, and a book I’m not quite sure how to define. It’s a picture book for older readers, 7-10 years old, written in verse novel format but it’s a picture book. There are all these things I’m working on or have completed, I’m waiting for a sale! A number of folks have told me they like the fact that it’s a fun book to read. There’s always something new to discover. The way you phrase something or part of the illustration they didn’t discover before. As I’m always telling people, when you’re writing a picture book, you think children are your primary readers, but that’s not entirely true. I don’t want the parent to pick up Flashlight Night and think, Do I have to read this again? I’m glad it appears that Flashlight Night is not one of those books!